An anti-Purge presidential candidate finds herself on the run from Purge supporters. The pencil case politics could be excused if the movie succeeded on its own terms, but it fails as a satire because it takes itself too seriously, and as an action movie it's a bore, suffering from director James DeMonaco's inability to construct an effective set-piece. 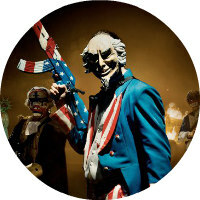 The Purge series began back in 2013 as a relatively low-key horror movie with an intriguing premise - in an alternate America, all crime is legal for one night every year, which apparently reduces crime dramatically for the other 364 days. That first movie was little more than a tease, squandering the concept by confining its action inside the home of a suburban family and failing to explore the wider implications of such an odd law. 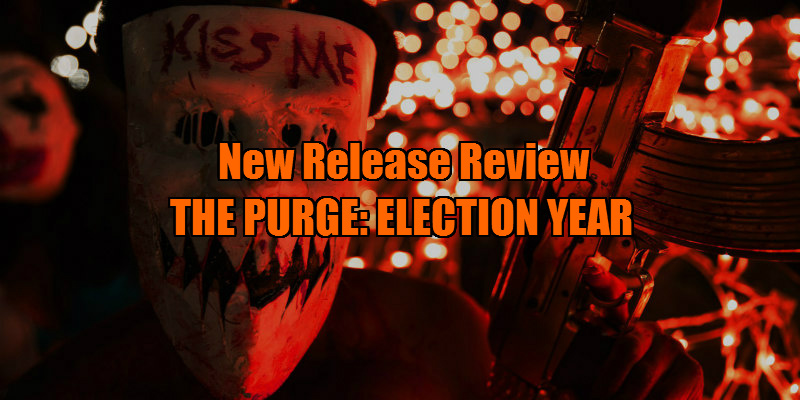 The rapidly produced 2014 sequel The Purge: Anarchy opened out its world, setting the action out on the streets and introducing an element of the conspiracy thriller - the rich are using the Purge to wipe out the poor, which seems counter-productive, but sums up the depth of the series' political insight. 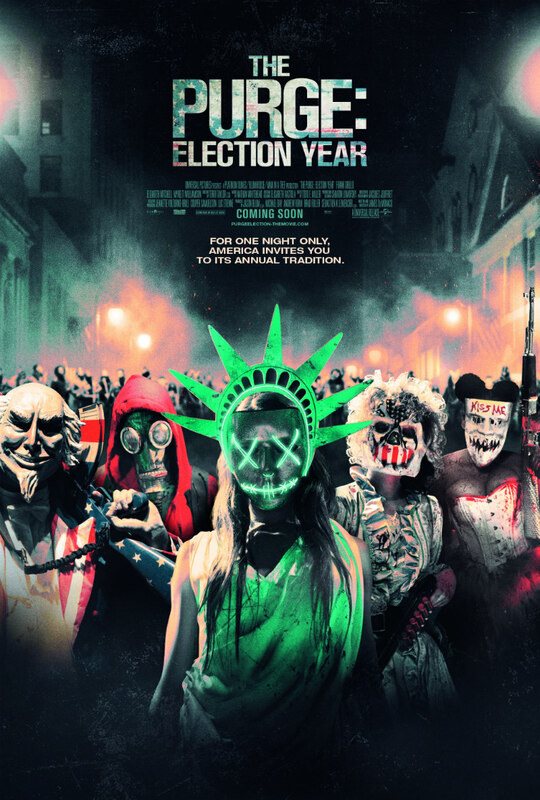 In this third installment, the political element is brought to the fore, with 'Purge Night' occurring in the run-up to the US election. The ruling New Founding Fathers of America party wishes to maintain the status quo, but opposing them is an anti-Purge senator, Charlie Roan (Elizabeth Mitchell), whose popularity is proving a threat to the NFFA. The latter decide their only option is to assassinate Roan, and what better cover than Purge night? Protected by Leo Barnes (Frank Grillo), whom we met as a would be vigilante in the previous film and is now serving as her chief security officer, Roan finds herself running for her life on Purge night, facing the threat of the mercenaries hired to kill her, along with the many 'Purgers'. One of the worst side effects of Donald Trump's presidential campaign has been the dumbing down of politics on both sides of the divide; with complex and nuanced issues reduced to gif friendly memes and 140 character sentiments, it's made dumb people political and political people dumb. The Purge: Election Year has all the political depth of a Banksy mural, relying on the tired old "rich people bad, poor people good" trope. There are explicit references to real world American politics and recent controversies, with the NFFA represented in red and Roan in blue, and the mercenaries hunting her sporting Confederate flag patches (somebody needs to look up the definition of 'mercenary'), which certainly won't do much to heal the wounds of America's ongoing culture war. Most of the heroes are black, but their dialogue is so clearly written by a white man it's often cringeworthy and uncomfortable to listen to. The NFFA villains are shown to be devoutly religious, in contrast to the real world where religion is embraced most by those in poverty. And for all its dubious liberalism, the film extricates its protagonists from every life-threatening situation through gunfire; the NRA would approve of its "good guy with a gun" rhetoric. Ironically, it was British, not American politics that Election Year ran into real world trouble with, having been pulled from its original UK release in the aftermath of the politically motivated Jo Cox murder. The pencil case politics could be excused if the movie succeeded on its own terms, but it fails as a satire because it takes itself too seriously, and as an action movie it's a bore, suffering from director James DeMonaco's inability to construct an effective set-piece. The only element that stands out is the costume design, and the film is all too aware of this, as every time we're introduced to a new group of extravagantly clad Purgers the movie enters slow motion mode, as if they're entering the Celebrity Big Brother house, forcing us to acknowledge how clever the costume work is. Heaven forbid DeMonaco should ever remake Walter Hill's The Warriors; it would run for three hours. The Purge: Election Year is in cinemas now.